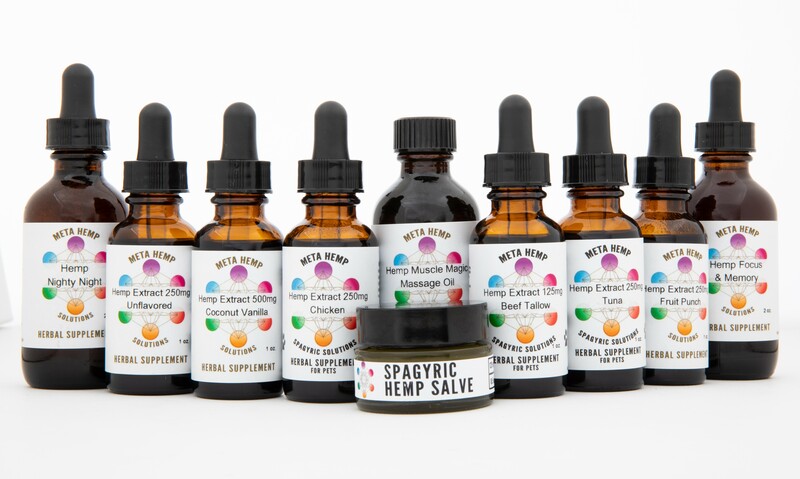 Our CBD-rich hemp extracts and salve are unlike any other hemp products on the market. This is due to the high-quality organically grown hemp we use, as well as our special extraction process. We have revived an ancient process called spagyric extraction. This method is based on alchemical traditions, but has been updated to work with our modern equipment. This process extracts both the hydrophobic and hydrophilic therapeutic plant constituents in a way that preserves the content and integrity of the cannabinoids, terpenes, alkaloids, fatty acids, and minerals. This truly whole-plant extract serves as a therapeutic source of cannabinoids while providing the necessary nutrients for those cannabinoids to work properly. Customers need to use less of our product to achieve the same effects as other hemp extracts available in the market. These other extracts are typically either isolates (research shows that these isolate molecules are less effective or ineffective) or extractions from either CO2 or other solvents that focus ONLY on the hydrophobic extraction (lipids or oils) and often damage delicate volatiles. Thus, while many brands claim to be whole-plant extracts, they fall well short when compared to spagyric extracts. Click here to see the Gas Chromatograhy lab results on how the spagyric process changes the profile of our products. We urge you to compare our products to any other CBD extract! The spagyric process we use produces a raw extract, meaning the temperatures during our extraction never exceed 98 degrees Fahrenheit. This protects the most easily degraded therapeutics and creates an extract with these constituents still intact. We then combine the pure mineral salts of the leftover extracted plant material with the finished hemp extract. This last step provides the widest-spectrum extract that is both therapeutic and nutritive. Many peer-reviewed studies are validating the idea that these wider-spectrum extracts are significantly more effective than single-ingredient isolates. Additionally, we only use local organically grown hemp. We test our plant material several times throughout the process to check for potency, pesticides, heavy metals, and bio-contaminants. We further ensure the quality and integrity of the finished product by using certified organic grape alcohol during the extraction process. The finished flavored products contain only organic MCT oil and organic flavoring in organic sunflower oil. In summary, our products are true full-spectrum hemp extracts and salves that represent the apex of current hemp research. We utilize this data to create the best possible hemp extracts on the market today. Due to the high quality of our organically grown hemp, our proprietary method of extraction, and the educated care we take in the process, we make the cleanest and most effective hemp product available. Our facility has been making over a hundred different herbal extracts and 30 different targeted blends for over 20 years, and we are proud of what we do! You can read more about our spagyric process here.